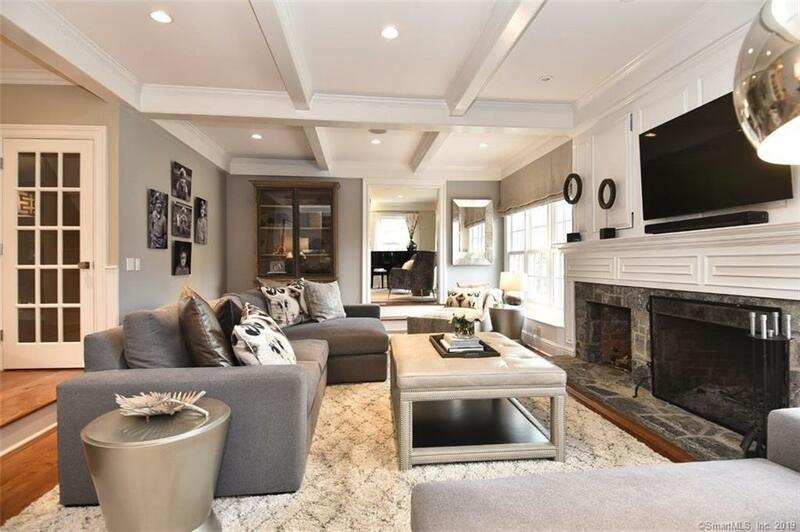 If you have, well, $2M in the pocket and need a house, I really recommend New Canaan! It has a quaint but happening downtown, lots of restaurants and parks, good schools, and Metro North will take you to Manhattan within an hour and half. Our house of the week has 6 beds, 8 baths on whopping 4.3 acres! When I was telling hubs about all the gardening I could do on 4 acres, he suggested I get horses also so I can ride next my gardening crew and tell them what to do. LOL – he kills me. I really wish the pool was rectangular one as those are so much easier: you can install a cover, keep kids, leaves, rodents out and if you remember to close it at night, it will retain more heat and thus cost you less. However, the freeform pool looks more natural and appealing in my opinion. Kitchen looks nice but a little too white and clinical. Maybe some custom shades and runner would warm it up a bit, really, a bowl with lemons would make it look more inviting. Living and dining spaces are fairly standard, actually the living room layout reminds me of our last week’s house of the week but they had hired a designer to redo the rooms and it shows. I actually really like this sunroom, the tile would have to come up but its spacious and has great light. Master bedroom is massive and has a fireplace in it which I love, the master bath is massive and has a gorgeous vanity area also. Another rec space with a fireplace and what looks like a bar. I would panel this space and turn it into a sophisticated man cave English library style. Bar area needs some shelving and lighting also. But on to rec areas outside! Golf – these residential putting greens are expensive to put in, depending on the size and how level the area is. Prices start from $11,000. Tennis courts – when you move to Fairfield County tennis is pretty much mandatory. All kidding aside, we love it (and are pretty bad at it) but it’s a fun way to work out and see your friends. Got to maintain the tennis courts though, so that’s another expense. And what do you when you don’t feel like playing tennis or putting? You play chess! Wonder how heavy these pieces are? The property also has several patios/outdoor entertaining areas not photographed. So what do you think? Would you be tempted or this is not for you? More details here.